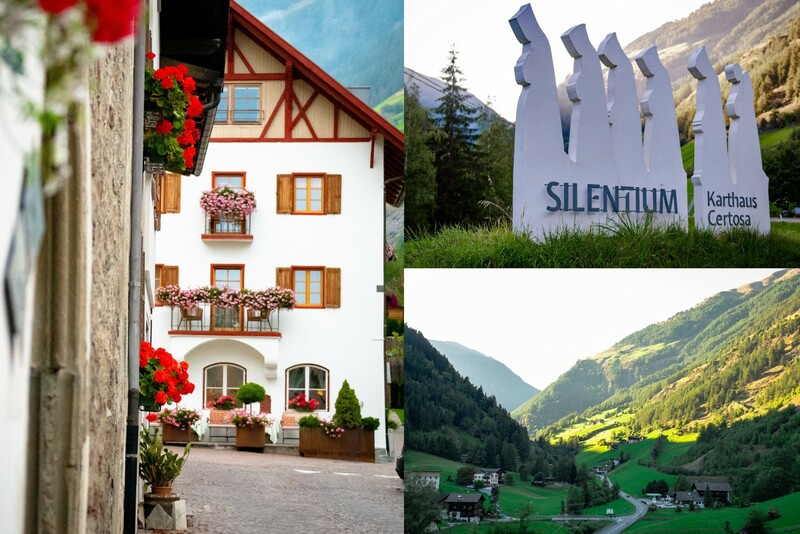 Beautiful and cozy Golden Rose hotel on the left; blissful and small Italian village, Karthaus, on the right [Credit: Rohi Muthyala]. 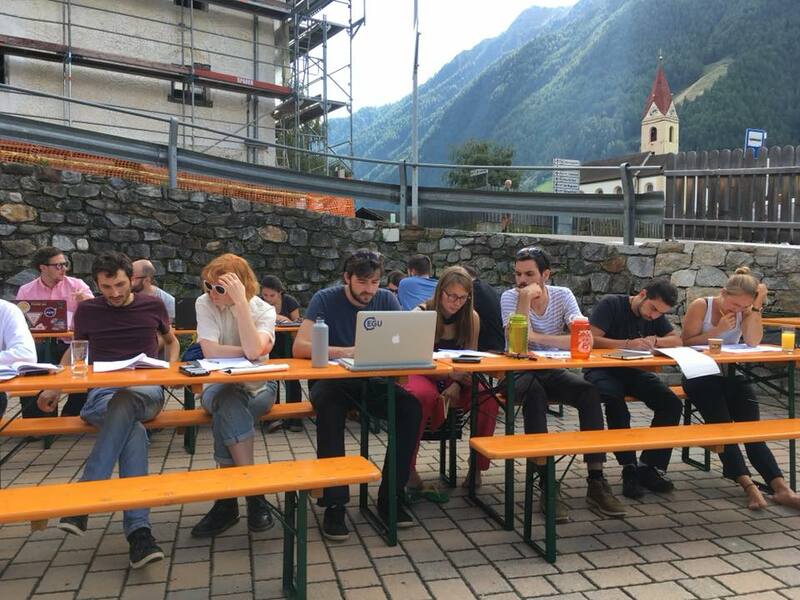 Nearly every year since the late 90s, during the summer, the picturesque Karthaus has hosted 10-day glaciology course. 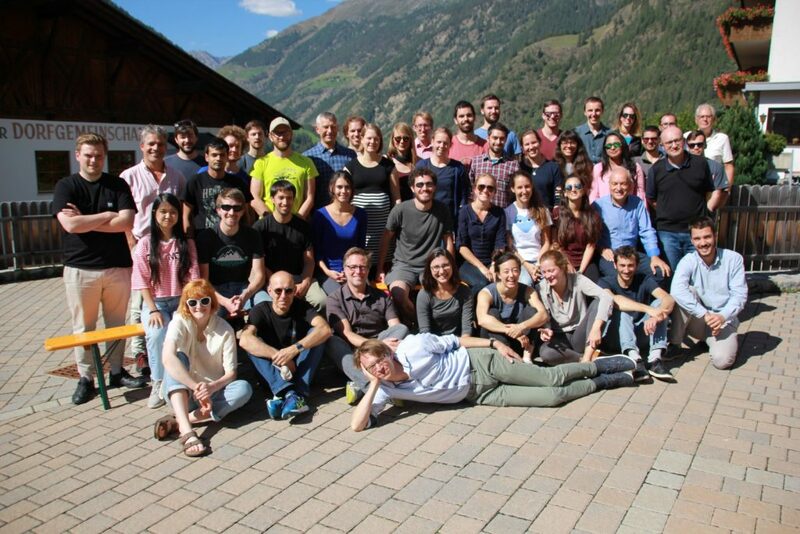 This school is a platform for glaciologists to explore, learn and expand their knowledge base. This helps researchers become multi-faceted: to view glaciology from the perspective of those specializing in other backgrounds such as hydrology, geomorphology, oceanography, etc. which complement one another in defining glaciology. Along with the intense course work, one can wholeheartedly cherish the exotic food, cozy resort, spellbinding views and delicious wine! Day used to start at 8 am with a healthy breakfast and then we head out to Katharinaberg to attend the lectures. Morning session of the course composed of four lectures with coffee breaks in between to keep us alert. These lectures were on a gamut of topics including numerical and analytical modeling, continuum mechanics, glacier hydrology, mass balance of the ice sheets, thermodynamics of ice, geophysical methods, geodynamics, ice core analysis, polar oceanography and geomorphology, etc. Lectures began with basics in every topic and gradually evolved into complex concepts, enabling students understand the subject better, irrespective of their specialization. After four hours of lectures, we, surrounded by lustrous green hills, enjoyed a delicious three-course lunch. Afternoon session was all about application of the concepts learned in the morning into numerical exercises and group projects. We were divided into 12 groups to work as a team for a group project. Each group was assigned a topic and a teacher to work with. Results from the group projects presented on the last day of the course, astonished me by the level of research we could accomplish in 10 days, showing the amount of knowledge gained through the program. School ended at 5 pm, leaving us with ample time to relax before dinner. While some students enjoyed it hiking, trail running and chilling in the sauna, I spent this time exploring Karthaus with a bunch of friends I made at the school and tried to capture the beauty of nature with my camera. 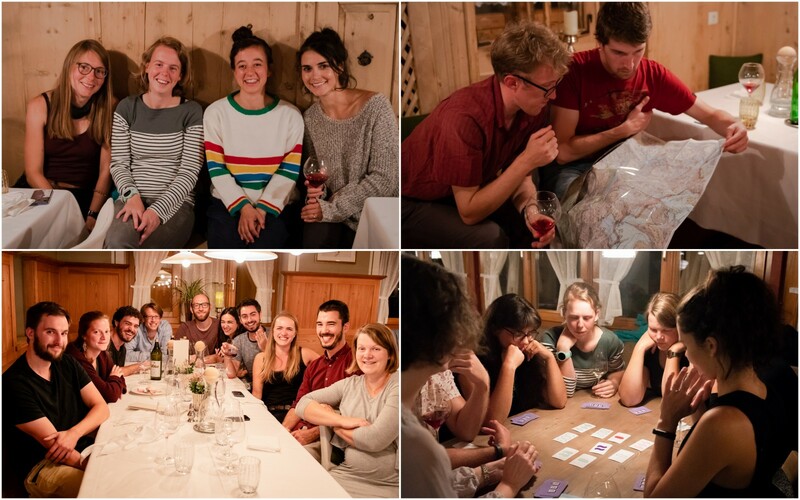 Then was the best part of the evenings – a five-course dinner with lots of wine and stories from our fellow glaciologists. I have never had such an exotic five-course meal, which was so tasty that I couldn’t help but overeat. 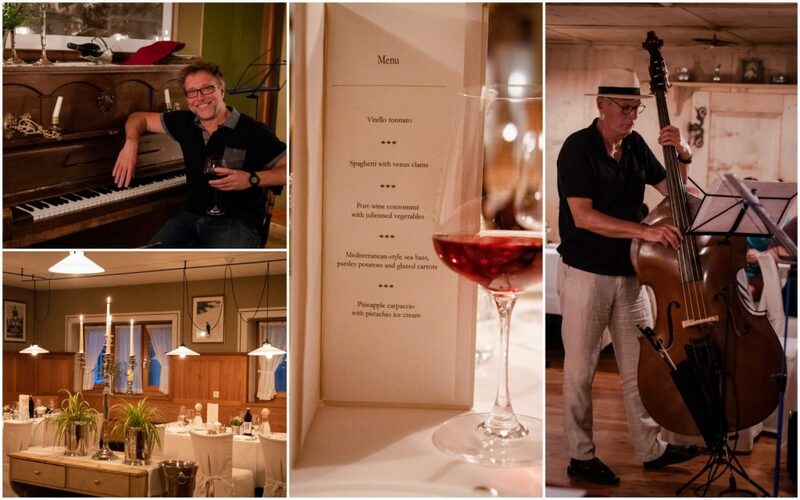 To top the delicious food, we had musical performances by Frank Pattyn and Johannes Oerlemans. I was amazed to know that most of the teachers have their own specialty with an instrument and that it’s a tradition at Karthaus to enjoy the evenings with their performances. After a two-hour long dinner, we moved to the bar next to the restaurant and continued our entertainment with games, wine and chatting. I wished there were more than 24 hours in a day to spend at Karthaus. This summer school is a complete package of education and entertainment. Entertainment after dinner with wine, games, chatting and as you can see, some map reading as well. Apparently, this year students are the most solemn group ever [Credit: Rohi Muthyala]. Adding to the fun, in the middle of the course, we had a day-off that most of us spent by going on an excursion to the Otztal Alps. A bus ride to Kuzras, a cable car to the top of Hochjochferner and hike down into the valley led us to the edge of the glacier where some stepped onto a glacier and/or entered an ice cave for the first time in their life. We stopped by Bellavista (Schonne Aussicht hut) for a hot meal and drinks before hiking higher onto the Italian Alps. Though we had been lucky with perfect clear skies throughout the course, we got a cloudy weather on our day-off to the Alps. Nonetheless, the experience of going well above the clouds in the cable car was the best start for the day. 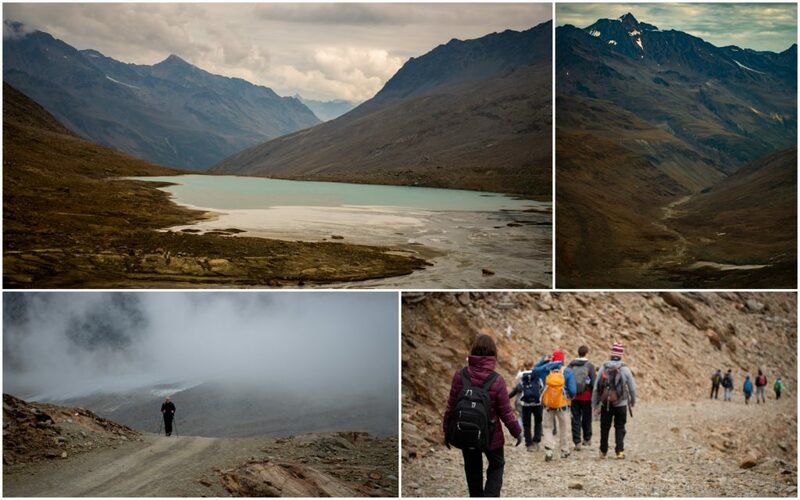 Hiking on a cloudy day from the top of Hochjochferner gletscher to bellavista [Credit: Rohi Muthyala]. This summer school would be an intense and beneficial experience for students in all stages of education. Be it a beginner in glaciology or an experienced final year Ph.D. student, I think the course has a lot to offer to every student. Especially to the students with no glaciology background, this could be a place to learn the basics and understand how to look for answers you are trying to find. With three years of experience going to Greenland for research as an Arctic hydrologist, I was still ignorant in some concepts (such as geomorphology, geodynamics, thermodynamics, etc) that are not directly related to my dissertation. This program opened paths for understanding those concepts in a productive way. I highly recommend this summer program to every graduate student studying glaciology and especially to those who are not from Europe, with few opportunities such as this to learn the basics in wide range of topics from glaciology. Another best outcome of this course was the opportunity to interact with fellow students and build a network for future collaborations. AGU and EGU have been mostly exclusive, and this provided an opportunity for me (from an American university) to get to know my fellow researchers from other parts of the world. I would also like to highlight the women participation in this course (roughly 50%) and appreciate the organizing committee’s effort to encourage more women in this field. Huge thanks to the organizing committee and all the teachers for their effort in making this an incredible experience. Special thanks to the convener, Johannes Oerlemans, for coordinating such a quintessential summer school. Rohi Muthyala is a PhD candidate from Rutgers University (New Jersey, USA), working with Asa Rennermalm. Muthyala comes from a multidisciplinary background of atmospheric, environmental sciences and geography, and currently focuses her research on Arctic hydrology and hydrological modeling. 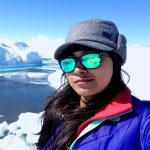 Objective of her dissertation is to model surface hydrological processes influencing the transport of meltwater over the surface of Greenland ice sheet.